Freedom from “Want” may be a modern slogan but the aspiration for such a freedom is as ancient as mankind itself. The degree of success achieved in reaching this goal has varied from time to time and country to country according to the means available and adopted. Every one does not have the capacity or the foresight to carry out a wisely devised plan of savings. Moreover, Individuals members of small means can hardly provide effective security against contingencies like old age, death, invalidity and other emergency expenses. These people have to depend on the capacity to work, for any reason, whatever they are not able to at work, for any reason, whatever they face privation and hardship. It is to meet this type of need that the concept of social security was developed. with this pious objective of providing social security cover to the workers and employees working in the tea gardens of Assam , emerged the Assam Tea Provident Fund and Pension Fund Scheme. 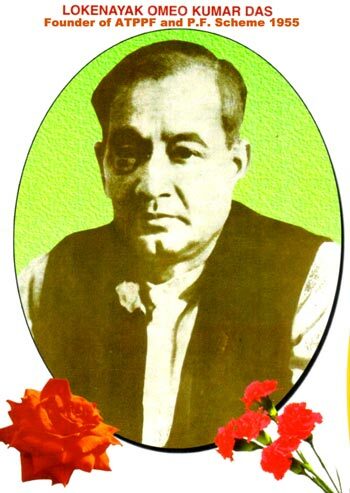 The Assam Tea Plantations Provident Fund Scheme, the only institutionalized social security cover to the tea garden workers of Assam which came into force w. e. f. 12th Sept. 1955. After introduction of provident Fund Schemes in 12th Sept. 1955, a series of legislation have followed with added benefits Presently the following Schemes are providing social security benefits to the workers in tea estates of Assam. The Assam Tea Plantations Provident Fund Scheme came into force with enactment of Assam Act X of 1955. Initially the Scheme brought under its purview only resident labourers working in the tea plantations in Assam. The Scheme was later amended on 01-07 -58 to cover all non resident workers. clerical and medical Staffs of different categories drawing a monthly salary of Rs. 1000. 00. The Act and the Scheme were amended from time with a view to bring more employees under the social security net. Presently an employees working 60 day in a period of three months drawing less than Rs. 5000.00 per month is entitled to be a member of the Scheme. In the year 1955 – 56 the Scheme could bring 4, 42, 371, employees under social security net. With relaxation of eligibility criteria i. e. length of service, the Scheme, the could cover more employees specially the temporary workers during the period 1990 to 1995. In the year 2003 – 04 the Scheme have touched the mark of 8 lakhs, almost double the coverage that was in 1995 – 56. The geometrical growth of membership has been indicated in diagriam-1. 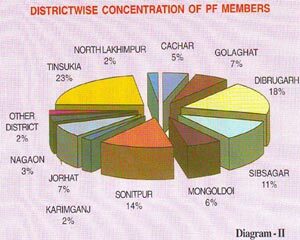 District wise concentration of members has been indicated in Diagram –II. Initially Plantations with an area of not less than 10 hector. under tea where twenty or more employees were employed and producing 511kg of made tea per hector. or 2044 kg green leaf per hector. or the plantations with an area of not less than 20 hector. 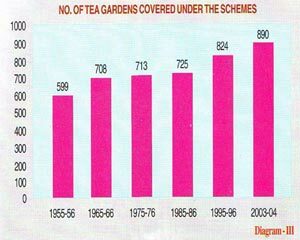 under tea employees were covered under the scheme. By a Subsequent amendment the tea factories without plantation employing 20 or more persons were also covered under the scheme. In the year 1955 -56 the Scheme could bring only 599 Tea Estates under it purview whereas it has brought 890 Tea Estates and Tea Factory under its ambit by the year 2003 -04. Diagram – III Shows the growth of covered units. Under the provisions of the Scheme a member is compulsorily required to contribute a specific percentage of his / her wages to the Fund. 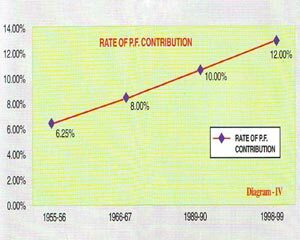 The rate of Provident Fund contribution was initially 61/4%. This has been raised from time. Provident Fund contribution is 12% . Member Provident Fund accounts are credited annually with interest on the opening balance in his / her P.F. account. The rate of such interest in the year 1955- 56 was 1.5%. It changes from year to year depending on interest earnest on P.F. contribution of member declared by Board of Trustees in different years from the year 1955 -56 to 2003 -04 (at 10 yrs intervals ) have been shown in diagram- v. The members are allowed to draw the full amount at his / her credit on cessation of his / her membership on account of retirement, resignation , death etc. A member after cessation of membership needs to apply to the manager who is also the Chairman of the Primary Committee of the garden for the settlement of his / her P. F. account. The Chairman, primary Committee is allowed to settle the P.F. account from the periodical P.F. collection of the periodical P.F. collection of the garden if it covers the amount payable in settlement of the account . Else, the Manager is required to submit requisition for remittance of the sum to the Head Office of the Board of The head Offices after necessary verification and process issue account payee cheque to the ceased member. 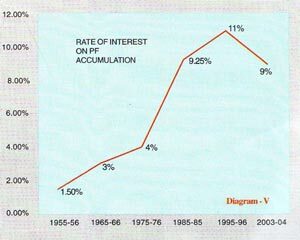 Diagram-VI above shows the amount paid an account of P.F. 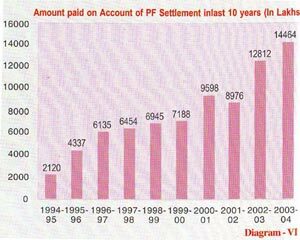 settlement in last 10 years. Generation of Fund is the prerequisite for the success of any social security cover . As such, the organization discharges this essential function very carefully within the existing frame work of relevant Acts & Rules. In the context of the variant and volatile situation of the money market it would be interesting to note the growth of the corpus for the parent Scheme of the organization “The Provident fund Scheme” Diagram VII& VIII shows the Provident fund collection in last ten years and grown of Fund in P. F. Scheme respectively. Neither the employee nor the employer is required to pay any extra contribution to the Pension Fund. The Board and the Govt .of India contribute 21/3 % and 1/6 % of the total wages of the members contribute 2 1/ 3 % and 1/6 % of the total wages of the members of the. members of the provident Fund Scheme respectively. All the member of the P. F. Scheme are automatically members of this Scheme as well. 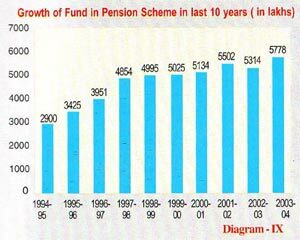 The diagram IX shows the growth of Pension Fund in last ten years. In the event of death of a members while in service the Board pays family pension Rs. 175.00 per month (at the minimum ) to his her family besides a lumsum grant of Rs. 2000.00 in the month of the death. When a member retires, is discharged or leaves service voluntarily he/she is paid a pension for a period that varies according to the years of service rendered and the amount of P.F. accumulation. 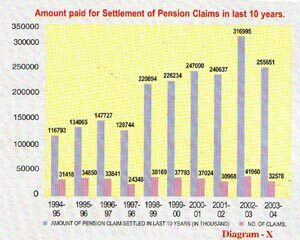 Diagram X, shows the amount paid for Settlement of pension claim in last 10 years. The Scheme came into force w. e. f. 1st Feb. 1984. The Scheme is applicable to all P. F. members under ATPPF & PF Scheme. The employees contribute 0.5% of the total wagers of the members in total wages of the members into the Fund. The Govt. of India contribute 25% of the total wages of members. The beneficiaries need not contribute to the Fund. 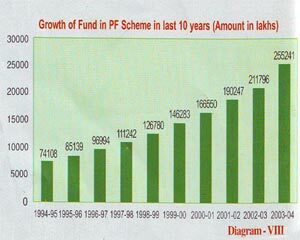 The Diagram XI shows of DLI Fund in last 10years. The statistics in the form of the diagrams above clearly indicate how successfully and consistently the Schemes have been able to provide Social security benefits to the beneficiaries in the changing economy of the country. This organisation has left no stone unturned in giving maximum benefit to its members and is consistently and consciously to a regime where the where the members can harvest the maximum.